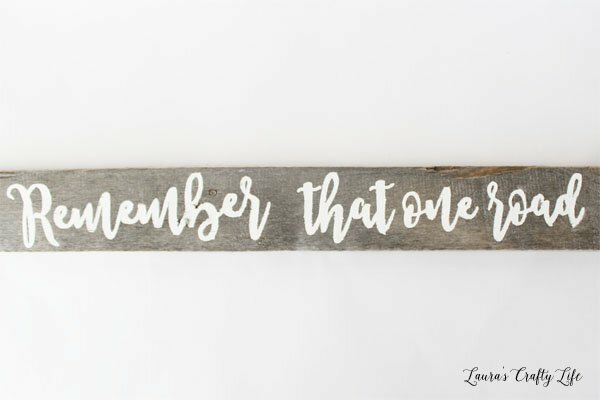 Hand painted signs and pallet board projects are very trendy right now. You can find lots of different options at your local craft and home decor stores. But, sometimes you need something more personalized. 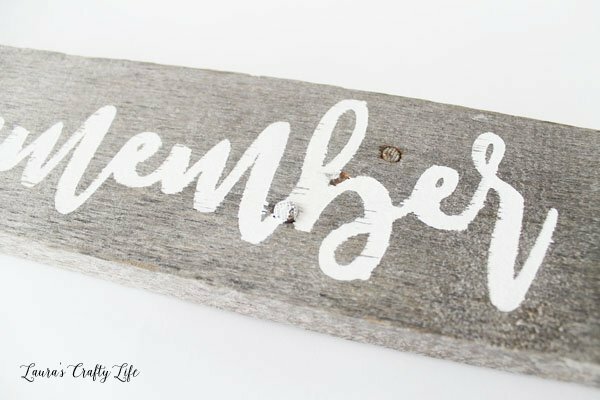 Today, I am going to show you how to make a DIY hand painted sign from a pallet board using your Cricut Explore. To start with you need to prepare your pallet board. This board was leftover from when we took apart a pallet to make our cat bed. Be sure to scrub the pallet board with soapy water and allow to dry completely before painting. Allowing the board to sit in the sun for one full day usually does the trick. 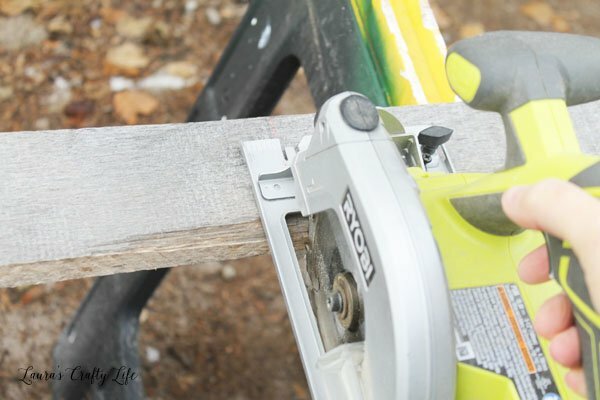 Once your board is clean and dry, cut it to the length you want using a circular saw. Note: Depending on the condition of your board, it may require some light sanding before moving on to the next step. 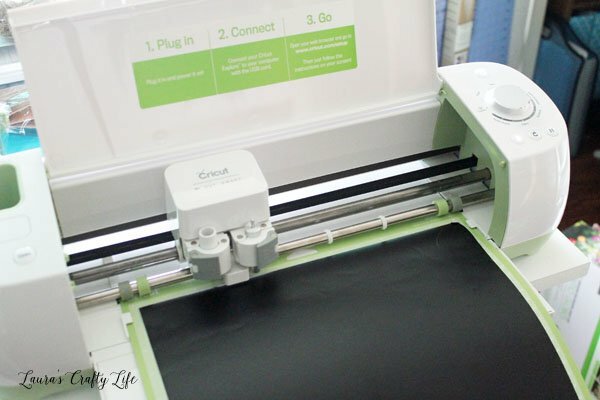 Open up a new project in Cricut Design Space. There are many fonts available in Cricut Design Space, but for this project, I wanted to use the font Freestyle I had downloaded on my computer. Add your text using the add text tab on the left. For script fonts, you have to move the letters to squish them together rather than have big spaces between each one. To do this, open up the edit tab on the right. Then, decrease your letter spacing until all the letters are touching. Once you have the word how you want it, choose weld in the layers tab. This will ensure your letters all cut as one continuous word, rather than individual letters. Helpful tip: If you have a few letters that are not spaced correctly, you can click ungroup in the layers tab and move individual letters where you want them. Be sure when you are done you select all the letters and weld them together. Click Go and change the smart dial to vinyl. Load your vinyl on your mat and cut out your words. 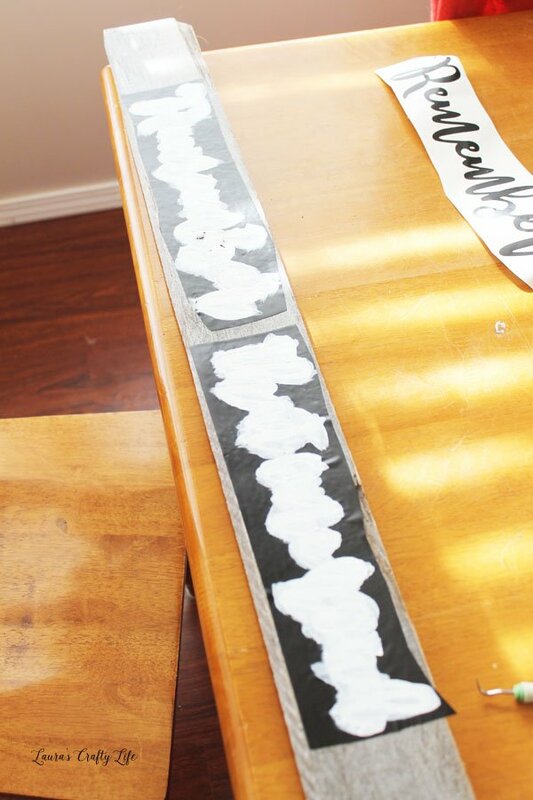 This is a great time to use up strips of scrap vinyl you have saved. 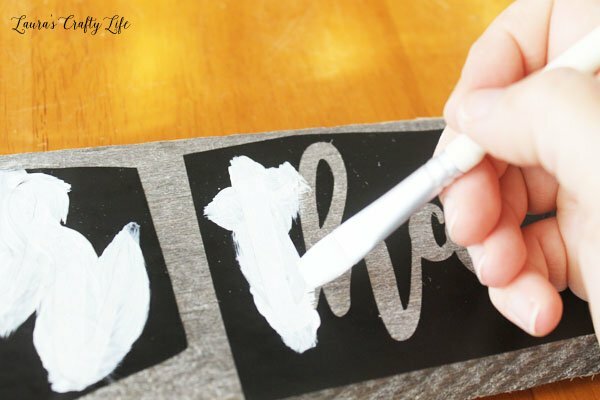 Instead of weeding the excess around your letters as you would usually do a vinyl project, this time you want to weed out the letters and leave the outline on the paper backing. Be sure to keep all the inside pieces for letters like a, o, e, etc. You will need these for when you paint. Once the vinyl is weeded, you can use transfer tape to transfer your design to the board. Smooth the transfer tape over the top of the vinyl. Carefully peel off the paper backing. Apply the vinyl to the board and smooth out with a scraper tool or old credit card. Carefully peel the transfer tape from the board. Note: Since the board is uneven, be sure that once you have applied the vinyl, it is important to go back and press down on all of the edges. This will ensure you get the cleanest paint lines. Using acrylic craft paint, fill in the empty spaces of the vinyl lettering. Be careful not to push paint under the edges of the vinyl. It usually works best to use a dabbing motion rather than a regular paint stroke. 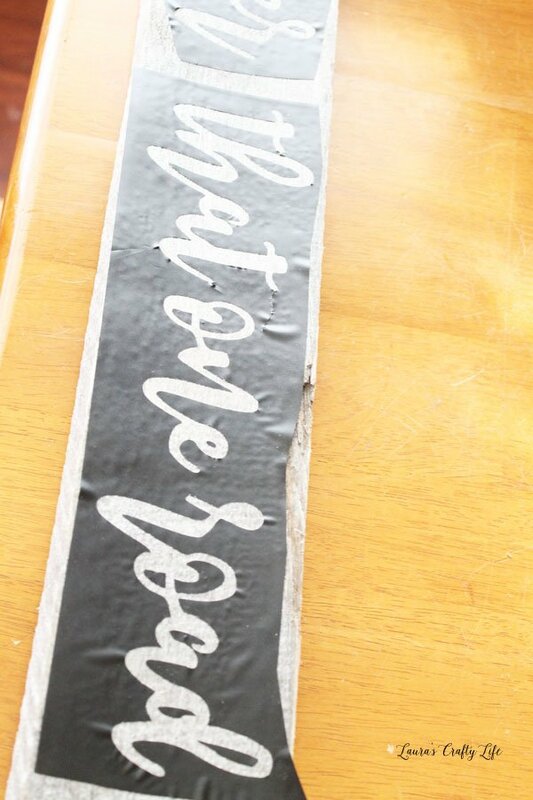 Peel off the vinyl while the paint is still wet. 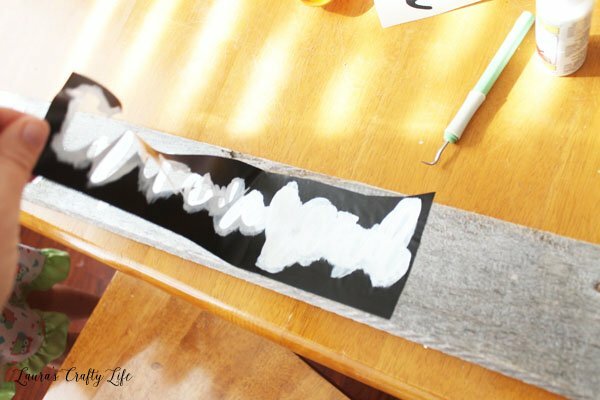 Once your paint is dry, you can attach picture hanging hardware to the back of the board and hang it on your wall. This sign is very special to us. My husband’s dad died several years ago. 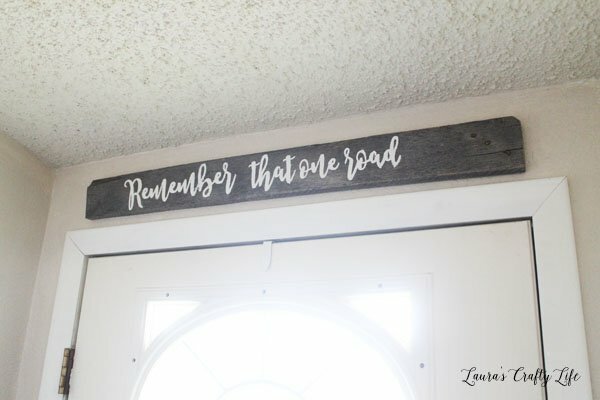 One of his favorite ways to start a story about times that he and my husband shared was by saying, “Remember that one road . . .”. It is a special memory for my husband and there is no way I would have found a sign like this anywhere in a store. This is one of the many reasons I love having a Cricut that I can use to make special, unique gifts. It now has a special place above our front door so we all see it as we leave the house for the day. 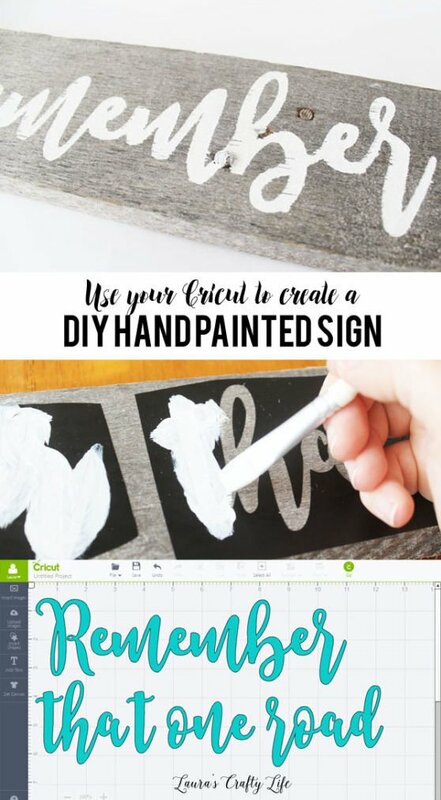 This is just one DIY project you can make with your Cricut. To see all my Cricut projects, check out my Cricut Project Page.